“Champs Fire 3,007 Total in Hectic Alley Session. They crowned a new champion last night as team competition in the City Bowling tournament came to an explosive conclusion at the Central alleys, and it’s a wonder today that the roof is still on the place. 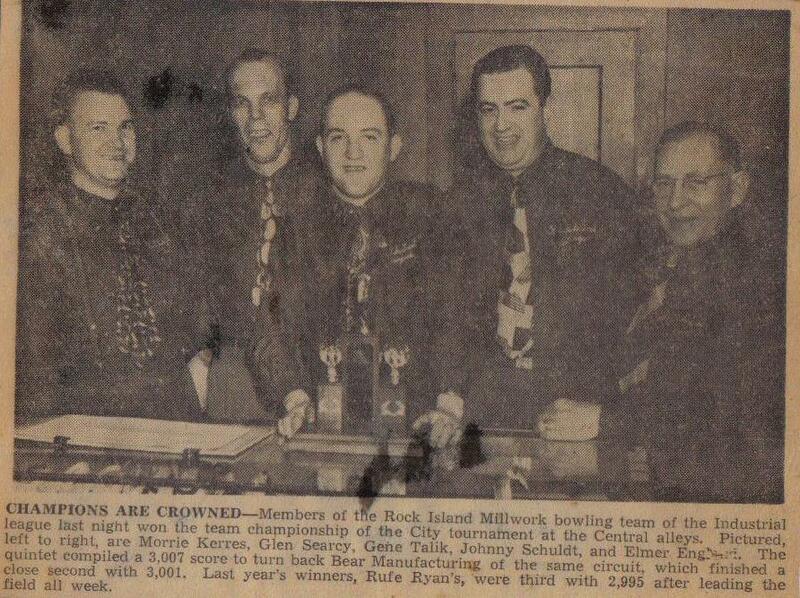 The Rock Island Millwork quintet is the king of the crews by virtue of its 3,007, but Bear Manufacturing company of the same circuit blew plenty of hot breath on the necks of the winners with a 3,001 total. Last year’s winners, Rufe Ryan’s of the All Service loop, finished third with 2,995. Their 1947 score was 3,035. There was so much excitement that even Sheriff Claude Taylor appeared on the scene – in an unofficial visit. Up until last night the Ryan outfit seemed a cinch to walk off with a second straight title. Then, with Elmer Engman leading the way with a sizzling 633 (190-241-202), the Millwork crew crashed through with its winning margin. Glen Searcy posted a 606 (170-202-234), Johnny Schuldt had a 542, Gene Talik rolled a 515, and Morrie Kerres contributed a 561 with a 210 game. A 150 handicap was added. It looked to be all over at that point, but suddenly Bear began to growl. But for a bad 10th frame they might be wearing the laurels today. Harold Kuehl paced the runnersup with a 612 (200-197-215), Rudy Starr fired a 491, Vic Michielsen blasted a 505, Stu Bradley drilled a 442, and Adolph Bulius posted a 519 with a 215 game. The 294 handicap was added, but the final was still six pins short. Reblogged this on Greater Rock Island County USBC.